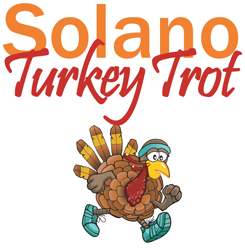 Additional race information can be found at http://solanoturkeytrot.org/. Welcome to our 9th annual Solano Turkey Trot being held in beautiful Suisun Valley on Thanksgiving Day, 2017. Race starts promptly at 8am for the 10K, 8:20am for the 5K, and the kids fun run starts at 9:30am. The main staging area for all race-day activities is at Solano Community College located at 4000 Suisun Valley Road in Fairfield, California. Other race-day activities include food & informational booths, awards, and other fun activities for the entire family. T-shirts are guaranteed with registration through November 10, 2017. The cutoff date for online registration is at 10PM on November 22, 2017. November 21st (Tuesday) between the hours of 12pm - 8pm. We will be located near the Dining Food Court on the 2nd floor. You can register in person at any packet pick-up location. T-shirts are not guaranteed at the time of late registration. The race day registration and packet pick-up booth is located in the main staging area and is clearly marked. Race day registration begins at 6:30 a.m. and ends promptly at 7:30 a.m.
T-shirts are not guaranteed at race day registration. This year's race will be separated by distance. Start line will be separated by pace markers. Strollers are asked to start at the end of the line. Closed course to traffic; USATF certification for 5K Run (#CA09047RS) and 10K Run (#CA09048RS); Disposable Chip Timing; T-Shirts; snacks, drinks, finisher medals and more! The Solano Turkey Trot is being held next to the Fairfield Campus of Solano Community College in beautiful Suisun Valley. When you enter Solano Community College, you will be directed to the parking lots. Please do not park illegally on any county or city roads or you may be cited and your vehicle towed. All entries are non-refundable and non-transferrable. Age Groups: 10 and under,11-19, 20-29, 30-39, 40-49, 50-59, 60-69, 70+. All participants will receive a finisher medal.